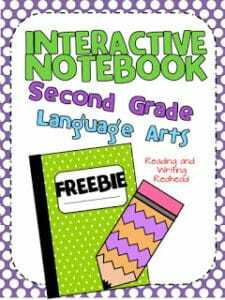 Writing can be challenging to teach, and it is also one of the hardest academic areas for some students- but have you tried using interactive notebooks in your classroom? And for writing? It can really help! Students get extra practice with skills and the skills and concepts are presented in a fun, interactive way! To help my second grade students, I worked on incorporating writing activities into my own interactive notebook pages last year. This freebie might come in handy for you and your students! You can grab this writing freebie from my Second Grade Language Arts Interactive Notebook. It will help your kiddos work on planning informational writing for a piece about plants and a topic of their choice. If you decide to download it, click here or on the image above. If you do download it, please take a moment and leave feedback. I always appreciate it! Also you may want to check out another Classroom Freebie post to help your students work on their writing skills. Click here or on the cover below to take a closer look. 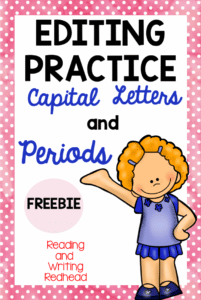 Grab this editing practicing freebie – students will edit for capital letters and periods. Watch their own writing improve, too!